You might want an email to sit on the timeline for a person contact and the timeline for an organization contact. #1. For a new email, create it from the organization's timeline. Now the email and its subsequent replies will exist on the organization timeline, as well as the timeline of the individual contact you send the email to. 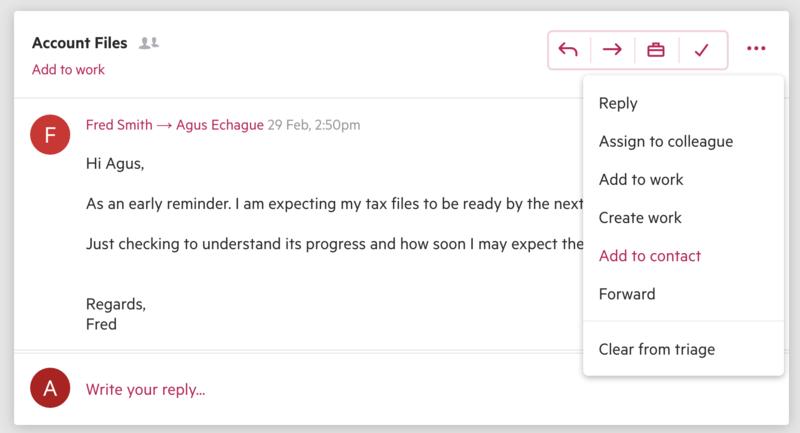 The email will exist on a third timeline if you add the email to a piece of work. #2. If your email is already in Triage, you can add it to a contact and then select the organization you want to link the email to. Now, this email and future responses will exist on the timeline of the sender, as well as the organization contact.